Sold 3 ounces of silver yesterday and I’m back with round 2. For 125 steem I will ship the 3 ounces in the pics. 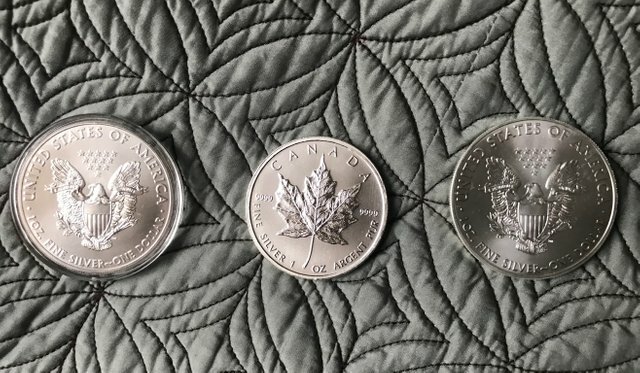 Two are silver eagles and one is a maple leaf. 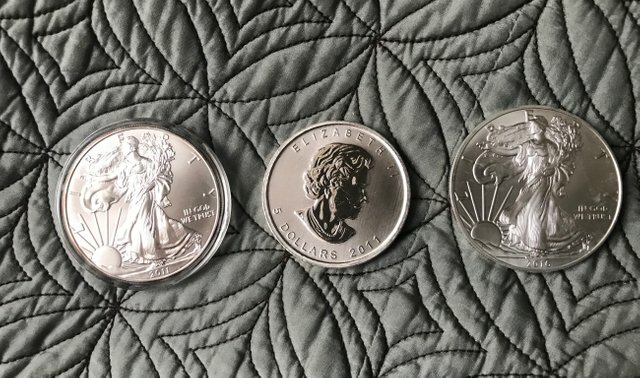 Silver eagles go for 2 to 3 dollars and more over spot. Selling all 3 for 125 steem and free shipping on the United States. That equivalent to about $16.25 an ounce. Just leave me a comment below and we can go to discord to work out the details. I got the 125. If nobody else has bought them I’ll send the steem! Ok. It’s yours. I’ve got your addy so just need the steem. Thanks! Got it. Thanks! Will get in the mail tomorrow and send you tracking. I just sponsored your for 5 shares of steembasicincome. Thanks again for the silver. What? Sweet. I don't even know what that is, but thanks! Ha. Go check it out @steembasicincome. You will get upvotes for life! They will be small with only 5 shares but you can add more later. This is quite affordable. Permission to resteem please,your buyer may visit my blog.